Press release from Boys & Girls Nursery. 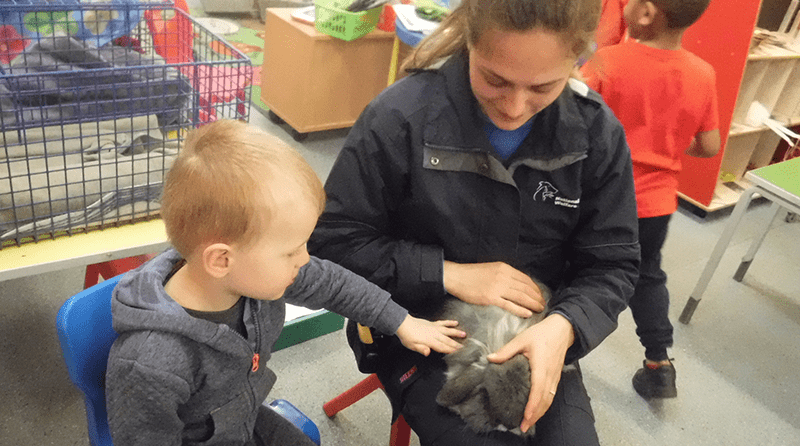 Children from Boys & Girls Nursery, Watford, enjoyed a visit from Tania and Georgia from the National Animal Welfare Trust to mark ‘National Pet Month’. The visit was both enjoyable and educational, with the children getting to meet Stewart the rabbit and learning about a rabbit’s diet and habitat and how to be a responsible pet owner. The children were treated with a gift to remind them of the important work the NAWT do in caring for and rehoming animals. Natasha Kirby, Director, Boys & Girls Nursery said, “We are so lucky to have such an important charity based close by, and we are so grateful that Tania and Georgia agreed to run a session with our Pre-School children – it’s essential to teach young children about caring for animals”. These visits are part of a wider set of ‘Mini VIP Events’ that Boys & Girls Nursery organise regularly to coincide with seasonal activities and days of interest.